Published: November 14th, 2018 by admin. Filed in Outdoor Umbrellas and tagged Commercial Umbrellas. While Sydney is known to experience pleasant temperatures throughout the year, there is still a massive risk of overexposure to the sun’s UV rays. That’s why so many businesses across Sydney use shade solutions to offer sun protection to their patrons. At Ashadya Shade Sails, we specialise in offering heavy duty commercial umbrellas to businesses across Sydney. Therefore, it goes without saying that I’ve seen commercial umbrellas used for any and every application possible. Today, I will share the most common uses with you. When you’re done reading this article, you’ll realise what a wonderful investment commercial umbrellas can be for your business. And if you don’t, then I recommend you read my earlier article, ‘4 Key Benefits of Commercial Umbrellas’. One of the most common uses of commercial umbrellas anywhere in the world is in the hospitality industry. 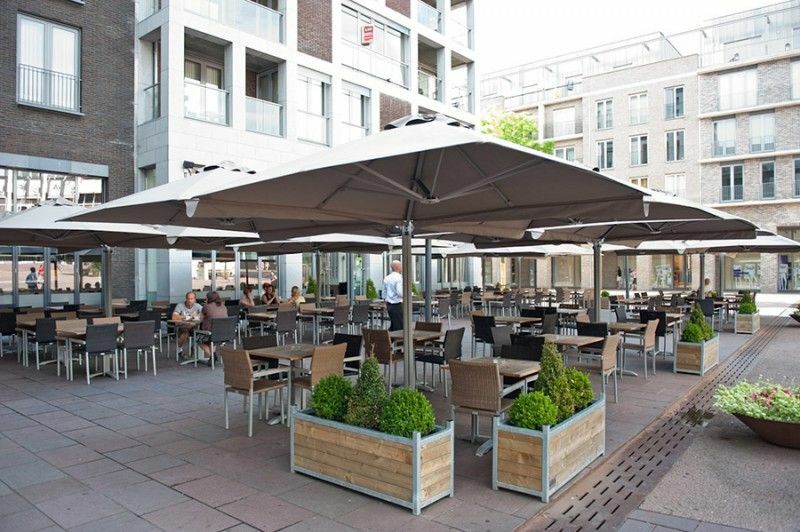 Commercial umbrellas allow restaurant, cafe, resort and hotel owners the ability to provide a cool and shaded outdoor space to their patrons. 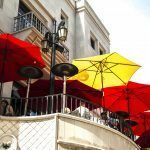 And not only do commercial umbrellas help keep patrons comfortable, but they also go a long way in increasing the visual appeal of a hospitality business and this can mean more customers and bigger returns. 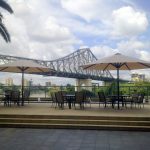 Another benefit for hospitality business owners – especially restaurant and café owners – is that they allow them to expand their outdoor seating capacity. Australian children are at the highest risk of overexposure to the sun’s rays. 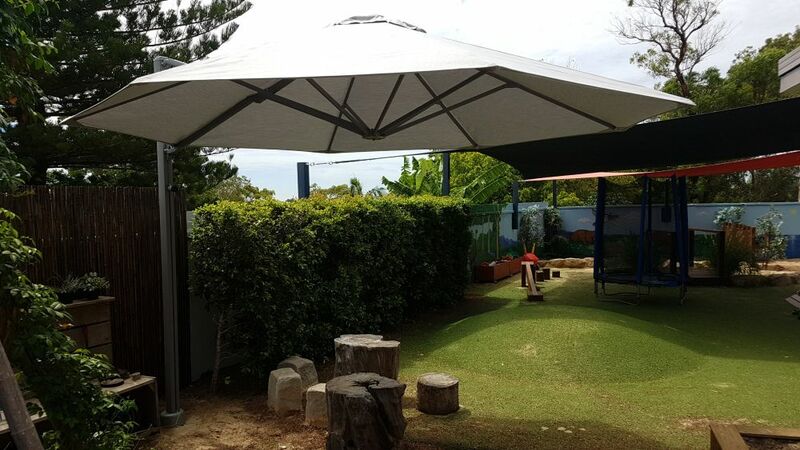 That’s why shade solutions, especially commercial umbrellas can be seen used widely across schools and educational institutions in not only Sydney but across Australia. Installation of a commercial umbrella over outdoor play areas, benches and cafeteria can help provide a cool and protected environment to children. Sydney is famous for its markets and malls, and commercial umbrellas are widely used in these areas. Markets and malls are always buzzing with people, and the best way to provide them with a comfortable, yet affordable environment, is with commercial umbrellas. You can even consider adding some seating under commercial umbrellas to make your space look more appealing and attractive to patrons. If you’ve ever noticed, many of the parks and playgrounds across Sydney also make use of commercial umbrellas. Local councils in Sydney have taken the initiative to ensure that our parks and playgrounds offer a safe and protected environment for people. Commercial umbrellas are great at doing so. Moreover, adding benches and seating under commercial umbrellas also offers people a place to relax and unwind. When it comes to finding quality commercial umbrellas in Sydney, you need not look any further than Ashadya Shade Sails & Blinds. We specialise in manufacturing commercial grade outdoor umbrellas which are suitable for use in a variety of applications. Depending on your requirements, you can consider either our SU10 Commercial Centre Pole Umbrella or our range of CE Heavy Duty Commercial Umbrellas for your business applications. Both of these outdoor umbrellas are manufactured to the best quality standards using marine grade, non-corrosive materials and they are built to last. Our outdoor umbrellas are available in a range of designer colours, and are backed by solid warranties on the umbrella canopy and the frame materials. Our commercial umbrellas are sleek and stylish, and they will also contribute to adding the ‘wow-factor’ to your business! 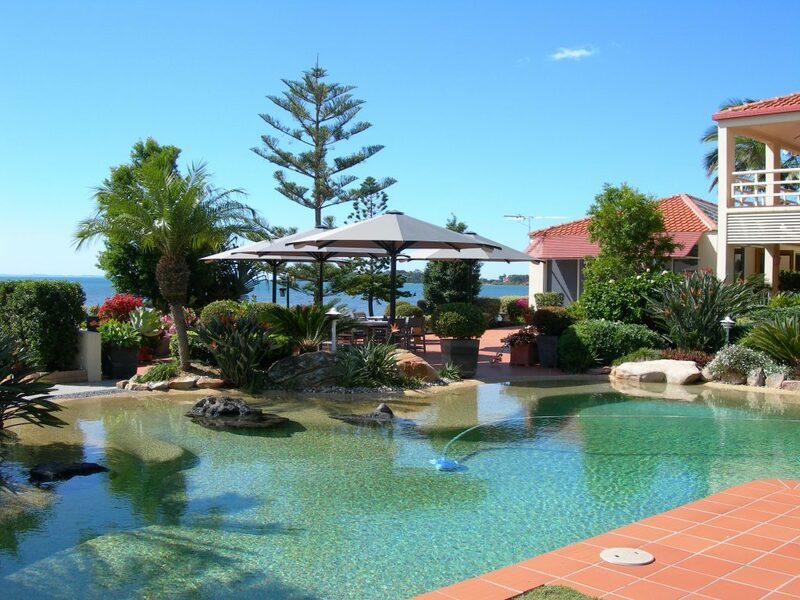 Commercial umbrellas are used in a variety of commercial applications across Sydney. They are most commonly used by the hospitality industry, by schools and educational institutions, in malls and markets and parks and playgrounds to provide affordable shade to patrons and customers. 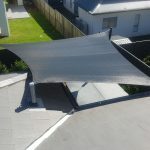 Regardless of the application you have in mind, when it comes to the best quality commercial umbrellas in Sydney or the surrounding areas of Kellyville, West Pennant Hills, Castle Hill, Glenhaven, Dural, Glenorie, Hornsby, Mt Colah, Mt Kuringai, Berowra, Gordon, Pymble and the North Shore, you cannot go wrong in choosing us at Ashadya Shade Sails & Blinds. To discuss your commercial umbrella requirements, call us at 1300 570 907 to speak with one of our experts today!